With wireless technology, no longer do new home owners need worry about networking cables behind walls or beneath their desks. This permits sleek floating shelving serving double duty at desk level for functional work space and computing. This modular design provides opportunities for storage beneath for tucking away things like storage baskets, filing cabinets or ottomans for additional seating. 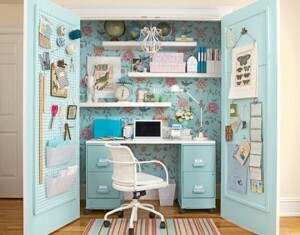 This colourful workspace makes use of clever shelving which can really store many items. For those who crave to have everything in clear view, this space arranges everything in an artful way so that all articles are exposed. To top off this look, these new home owners have hung a pair of green apple pendants which give this workspace a punchy yet functional look and feel. This dedicated home office features a combination of open storage and closed cabinetry allowing these new home owners to remain highly organized. The neutral colour scheme in the furnishings allow for the opportunity to introduce colourful prints with an area rug and office chair. Pulling colours from the rug and repeating them in the drapery and wall paint make this home office a unified space. Sometimes when you may not think you have the space for a dedicated home office in your new home, carving out a nook may be all you really need. This clever home office area makes use of an existing closet, now transformed into a highly functional and stylish home office. Best of all, when not in use or a tad untidy, simply close the doors and forget it! For more fabulous design ideas and home decorating inspiration for your new home, be sure to visit the Mosaik Homes Facebook Page!